Got a case of the Mondays? Perhaps Intel can help. The chipmaker today announced specifications for its upcoming 12-, 14-, 16- and 18-core CPUs that help make up the Core X-Series processor family. Prior to today’s announcement, Intel had only revealed full information up to its Core i9-7900X – a 10-core / 20-thread chip with a base clock speed of 3.3GHz that’ll retail for $999. We’ve known for a few months now what the rest of the lineup would look like but official details are just now being shared. The cream of the crop, as you’ve no doubt heard, is the Core i9-7980XE, an Extreme Edition chip packing a whopping 18 cores and 36 threads. This 165W TDP part carries a base clock speed of 2.6GHz, a Turbo Boost frequency of 4.2GHz, support for 44 PCIe lanes and a generous 24.75MB of L3 cache. 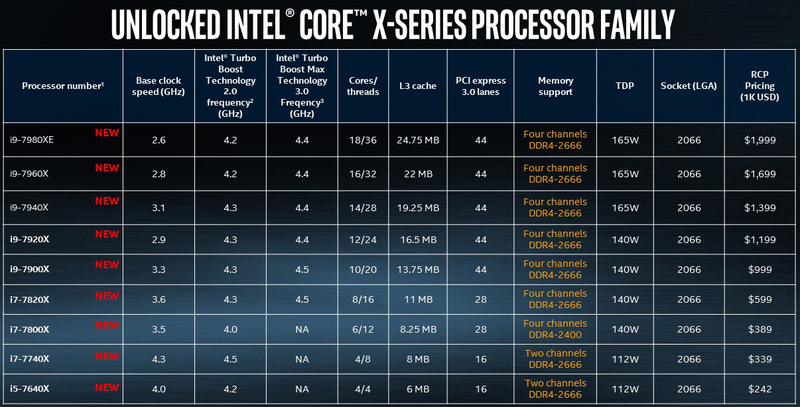 You’ll have to pay to play, however, as the Core I9-7980XE carries a steep MSRP of $1,999. Stepping down a notch, we’ve got the Core i9-7960X. This chip has 16 cores / 32 threads with a base clock of 2.8GHz, a Turbo frequency of 4.2GHz and 22MB of L3 cache. It, too, offers 44 PCIe 3.0 lanes and carries a TDP of 165W. Expect to pay $1,699 for the opportunity. Next in the list is the Core i9-7940X which is a 14-core / 28-thread CPU with 19.25MB of L3 cache, 44 PCIe lanes and a base clock of 3.1GHz (Boost up to 4.3GHz) for $1,399. Last but certainly not least is the Core i9-7920X, a 12-core / 24-thread part with a base clock speed of 2.9GHz that can Boost to 4.3GHz, 44 PCIe lanes and 16.5MB of L3 cache that’ll set you back $1,199. Intel says its 12-core CPU will launch on August 28 with 14-, 16- and 18-core processors set to arrive a month later on September 25.